LOOKIE HERE WHERE KYRA (THE108) DID! THAT YOU CAN FLY THE ENTIRE TIME MATT IS AT BOOT CAMP! Thank you for your brilliant designs! On Sunday, my wonderful friend Dixie will be traveling into Memphis to deliver her son Matt to the Marines. Is she proud? Absolutely, 1,000,000,000% proud. Her little boy who she brought into the world and nurtured and cleaned cuts for and taught to swim and all the other little things you do with your children that, when they are happening you think nothing can be better. Years later when you are apart, (this is from experience folks), there are times when you can sit and think back and feel a warmth come over you even when they are thousands of miles away. Matt is now a man and decided upon graduation from high school that he would join the Marines. Is she upset? Of course she is. This is her oldest, her only boy, and her loving son. Who would not be upset by their going away? 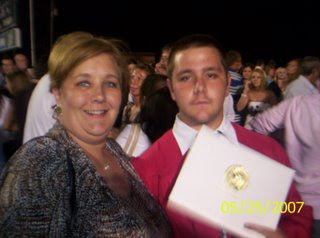 Even if it were to leave for college, mothers will feel a loss unlike anything we men can imagine. Sure, we men get sad…our kids are growing and leaving and we have been told it is more difficult if a daughter (never had one…wish I had), is leaving. When our sons leave, we most certainly feel the loss, but we also know they are beginning their new life. The last weeks have been a plethora of emotions for Dixie. They will continue over the next 13 weeks as Matt completes his boot camp where they "are cut off from the civilian world and have to adapt to the Marine lifestyle." Then he will come back to is mom, still her son and so much more. We are not even sure she or her brave son will see this before he leaves Sunday, but we ask every single reader of THE COUCH to take a little trip over to DIXIE’S HEART AND SOUL and just leave a little message. Leave it to Dixie…leave it to Matt…leave it to both of them, but leave one. It does not have to be tear inducing, just a “good luck & stay safe” will do. 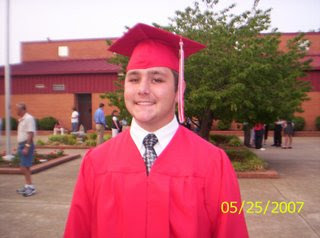 “Please Visit Dixie and Matt and Wish Them Well As He Leaves For Parris Island And The Marines on Sunday, July 22, 2007. What THE COUCH asks of you is to make it so when Dixie opens her blog on Tuesday, when she gets back, there are HUNDREDS OF MESSAGES (would it be too much to ask for thousands?). THREE MINUTES people and if all y’all do it, we can show my dear dear friend that she is not only not alone, but she is surrounded by some of the most incredible people in the world. Not sure why, but I am sitting here at my desk at work and the front of my shirt is wet from the tears….I hope they are tears of joy as you all jump on board. "MARINE CORPS HYMN (HALL OF MONTEZUMA)"
The Marines' Hymn is the official hymn of the United States Marine Corps. It is the oldest official song in the U.S. Armed Forces. The song has an obscure origin—the words date from the 19th century, but no one knows the author. The music is from the "Gendarmes' Duet" from the opera "Geneviève de Brabant" by Jacques Offenbach, which had its début in Paris in 1859. The Marine Corps secured a copyright on the song on August 19, 1919, but it is now in the public domain. The initial verse is "From the Halls of Montezuma to the Shores of Tripoli". The Montezuma phrase refers to the Battle of Chapultepec. The Tripoli phrase refers to actions during the First Barbary War and the Battle of Derne. This is beautiful and moving and of course there will be many messages of support to wonderful Dixie and her lovely Matt from me. I know how hard it is to say goodbye to the ones you love and it is a time when many hugs mean so much. Wonderfully done, Vinny. Mine will be up Friday or Saturday. You're a hell of a guy. You know that right? I had a post for Dix I was going to put up this weekend. I'll be adding this to it. Ok, will do. Wow - that's come up fast. You make the Hoochies and Hotties proud honey. You big ole softie you! We are fortunate to have such men in our lives. Matt has been and continues to be in my thoughts and prayers every day since my sister by choice told us of his plans. I burst with pride knowing what a fine soldier he'll make. Now I have to go re-apply my make-up. You are so sweet, Mr. B (and of course we all love you for it!). Mine's up, and I'm happy and proud to do it!!! 108: TY... if the messages help Dixie to dope, then it is a good thing. PIA: SMOOCH for that dear. Vince - What a wonderful tribute to Dix and Matt! You are a great man! Have posted my words to Dix and Matt in her blog. 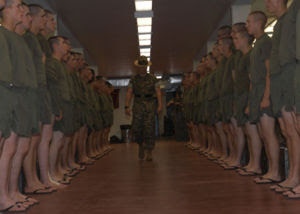 Now going to my blog to post a few words about the Marines. Mission accomplished, I had a post planned for tomorrow but will put it up today. Vine - My tribute to Matt is complete. Any further instructions, SIR! Seriously you are a dear for starting this wonderful tribute and allowing all of us to show our love and support for both "our" Dix and for Matt. I will have it up tomorrow Vinny. Cheers!! hugs Vinny. it'll be done this morning. love you. I'll head over there right now! Dixie is a sweet lady and I'm proud to do this for her! What a great thing to do---no wonder we all love you. Bond, I have made a banner for Dix and Matt that's up on my blog if you or anyone else wants to steal it :-) I'm also gonna make a smaller sidebar one for Matt support while he's away if anyone wants that one as well to show some support while he's away. Well done. You are good to your friends. That is to be admired! Bond, Great job. I'll head to Dixie's right now. This is so sweet! Thanks for the heads up on this. The puppy will fly this banner too. Hugs! 108: YOU ARE THE MOST INCREDIBLE PERSON...I LOVE THE BANNER AND WANT THE SIDEBAR! I don't what else to say. I'm going to try and make a few blog rounds tonight. DIXIE: Darlin' our great pleasure to honor your family this weekend dear.